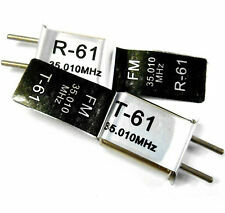 To suit 35 MHZ Frequency Radio Kits. FM Crystal 35.010 (1 pair). Hitec Compatible Red Ikonnik KA-6 6 ch Receiver 2.4GHz AFHSS POST FREE Price! This is a Genuine IKONNIK Product supplied to us by the UK Hitec & Ikonnik Distributor. 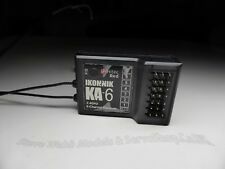 Hitec Red Ikonnik KA-6 6 Function Aircraft Receiver Full Range. Hitec Red 2.4GHz radio protocol the KA-6 6-channel aircraft receiver is not only the perfect partner for your IKONNIK KA-6 transmitter, it's compatible with all Hitec 2.4GHz air transmitters and boasts full range radio reception. 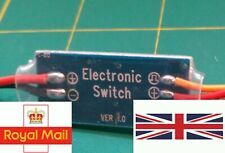 RC Receiver Controlled Electronic On Off Switch R/C Remote. For lights, smoke. 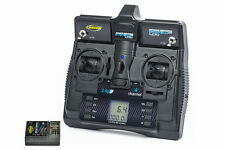 Carson C500085 Reflex Stick 3.1 2.4Ghz 4 Channel LCD Radio (2 Channel Stick 2 Toggle Switches) with Receiver. This is an upgraded radio over the standard 2 channel for Tamiya RC cars, boats and 2 channel glider / powered glider aircraft. Ultra High Definition 1000TVL. Sensor: 1/3 "CCD. With 1/3" CCD sensor. Lens: 2.8mm IR coated. Screw of Lens: M12. 1x Lens Cover. Power Consumption: 105mA-27mA. Ultra-low power consumption. Eachine ROTG01 UVC receiver is a new receiver that you can connect to your smart phone directly instead of heavy monitor and good for those who feel dizzy when wear FPV goggles. It has low latency around 100ms. 150CH auto search allows to cover all 5.8G frequency bands. Futaba 4 channel R304SB receiver T-FHSS. Condition is Used. Dispatched with Royal Mail 1st Class. Spectrum Dx6i with manual and case. All works fine, mode 2. LiPo flight battery, video or other accessory battery. FrSKY FBVS-01. The FBVS-01 sensor is supplied pre-wired to pin 3S on the circuit board for monitoring LiPo batteries up to 5S in the range: 0V~19.8V. Lemon RX 6 Channel Receiver FULL DSMX & DSM2 / Spektrum Compatible UK Stock. XP2G 2.4GHz 2-channel Radio System Features Transmitter XP2G 2.4GHz, 2-channels. Pistol grip wheel style. Team Associated 2.4GHz transmitter and receiver. Advanced 2.4GHz frequency-hopping spread spectrum technology . Original Spektrum SR3100 3 channel DSM2 receiver, not a cheap Chinese copy. In excellent condition. SMD SRX Sanwa compatible receiver FHSS-3 - FHSS-4 SMD are proud to introduce our new Sanwa compatible SRX receiver. Our new receiver is compatible with Sanwa M17, M12, M11x, MT-4, MT-4S, MT-S, MT-44, Exzes X, Exzes Z. Exzes ZZ, Gemini X. Suit for GT2E GT2G transmitter. For FlySky FS-A3. 1 Receiver For FlySky FS-A3. Model type: Airplane / Glider / Helicopter. Channels: 3 Channels. 3CH receiver. RF receiver sensitivity: -105dbm. Band width number: 140. Features:The system is specially developed for all the Radio control models, that offers super active and passive anti-jamming capabilities,It is in very low power consumption and high receiver sensitivity.It is so convenient to use.High technology and exquisite workmanship.Description:Channels: 3 ChannelsModel type: car/boatRF range: 2.40-2.48GHzBandwidth: 500HzBand: 160RF power: less than 20DB2.4G system: AFHDSCode type: GFSKSenditivity: 1024Low voltage warning: yes(less than 9V)DSC port: yes(3.5mm:output:PPM)ST range: 90TH range: 45(F:30;B:15)Charger port: yesPower: 12V DC(1.5AA*8) Brand Unbranded/Generic MPN Does not apply UPC Does not apply EAN Does not apply. RadioLink R4F, 4Channel Receiver for RC3S, RC4G, T8FB, and the new RC4GS. Modulation mode: GFSK, FHSS. One of the best ways to keep your finger on the pulse is to be involved. 2.4G 4channel receiver. Well known and trusted model. The receivers I have not tested so they are sold as seen but I see no reason why they should not work as they did when I last used them. The MicroZone MC7RB is a full range 7 channel receiver featuring MicroZone's unique internal antenna system. The MC7RB utilises the latest FHSS Modulation to ensure your 2.4GHz connection is the best it can be and for those needing a little extra functionality, it also includes 1x S-Bus channel. The SR215 also features a new, modern case design that is small, streamlined, and ready for nearly any RC application. The case also features added antenna support and an integrated antenna tube slot for seamlessly easy installation. Airtronics Sanwa Mx-V- Radio Controll 2.4gh Receiver Rx-37w Rc. Only used 3 times. Delivery to Mainland UK only. Item model: TX5258. 1 x TX5258 transmitter. Finally, should you forget to attach your antenna, the transmitter won't burn out because it'll sense the problem and wait for one to be attached, before it transmits any signal. (The ARX-482R is a 4-channel receiver and is compatible with Sanwa FHSS-3 and FHSS-4. 4) Press ENTER again on the transmitter, the LED will be solid, indicating binding process is successful;. 2) Pressing the "SET" button of receiver and power on, the LED on the receiver will flash slowly. AR610C User Guide. DSM2 / DSMX. Trackstar. Ts3t digital proportional. Radio control system by TURNIGY . Channels. 3ch. 2.4g system fhss. Power 4.4v-8.6v Condition is Used. Dispatched with Royal Mail 1st Class.